The Walking Dead continues on AMC tonight with all its gory goodness with an all new Sunday October 25, season 6 episode 3 called “Thank You” and we have your weekly recap below. On tonight’s episode, Rick (Andrew Lincoln) and the group head back home. On the last episode of The Walking Dead, just when it looked like things could return to normal, or as normal as things could be in the apocalypse, a new problem arose for the Alexandrians. Did you watch the last episode? If you missed it, we have a full and detailed recap right here for you. You aren’t going to want to miss any of the unfolding action tonight. We’ll be recapping the season 6 episode 3 live right here for you at 9pm. In the meantime, hit up the comments and tell us what you’re expecting from season 6. #Walking Dead starts with Rick and Kevin running and then they radio Tobin and tell him to light it up. They are running to try and get ahead of the horde – half are headed for Alexandria. Rick radios the team to tell them about the loud horn. He tells them they have to keep going so the herd keeps moving. Rick says if the other half also goes back, things will get worse. Nicholas is freaked out and another twists their ankle. One says Rick brought them all out there to die but Michonne tells him to shut up and keep running. Rick tells them he’s going to get the RV and circle back to try and cut off the herd. Glenn wants to come with Rick but he says they won’t all make it. He tells Michonne and Glenn if they can’t keep up, to let them go because they have to get back. Heath lurks nearby and hears this and then there are screams as another of their crew gets eaten. Michonne puts her sword into the dying man’s head. Rick says the horn stopped then says that’s good. He takes the dead guy’s weapons and tells them to be safe. They are all freaked out by being in a life or death scenario like this. Glenn says they’re 10-20 minutes ahead and Michonne says they have to keep this pace. Sturgess freaks but David says they have walls for a reason. Sturgess says his wife might be dead and Glenn says focus on how to make things go right. Michonne says they have to move forward and end whatever is ahead of them. Glenn, heath and Michonne run ahead to kill walkers and tell the others to stay back and not shoot unless they have to. A few others get brave and join in. An idiot pulls the gun and shoots his friend when a walker grabs at him. Then the moron runs off. They save the guy who was shot but he’s still in bad shape. Then another creeps and bites another on the back. Michonne and Heath share a look and the guy says he knows what it means. He says they need to keep moving now. Daryl pulls up and says he needs to change the plan. He thinks five miles is enough but Abraham says the mission was 20. Sasha tells him they need to stick to the plan but he can go back if he wants. Daryl sees a sign for Alexandria then says he has faith in them and speeds off ahead. Sasha screams at him but he’s already gone. Michonne and the others make it to the road. Now they have two with leg wounds and one with a bite. Michonne asks if she can look at the bite and says it’s about what you’d expect. He says he didn’t expect this then tells her he’s been married for three months. She asks how they met. He says Aaron found him alone and he had lost his family and his other wife. He says he wasn’t crazy but had given up on being a person. He says they found Betsy on the way back to Alexandria and says Betsy made him more – better than how he used to be. He says if he can’t make it back, he wishes he could tell her that finding her in all this was everything. One wants to stop and bandage the shot guy but Glenn says they can’t stop out in the open. They hit a little town area and Michonne tells them to check for a working car. Glenn tells Michonne he needs to get home and says they should pack Scott up and get going. Michonne says they’re ahead of the herd and says it’s maybe half an hour now. Heath tells Nicholas this is where it happened. Nicholas says he and Aiden didn’t know what they were doing – their crew died there. Nicholas says the others weren’t afraid but he and Aiden were. Glenn says no luck and says they have to go on foot. Heath tells Nicholas was here last and can show the way. They help their three wounded and walk on. Nicholas spots a hat on the grand and it looks like it belongs to Sturgess. They tell Nicholas that the guy left them behind. They find walkers feeding on Sturgess and more coming to join the feast. Glenn grabs him and they move silently back. There are walkers all around. Glenn tells Nicholas to think. They head into a little pet store. They lock the doors and Michonne sees the desiccated animals still in their cages. Heath looks around and Michonne says they can pack Scott and Annie up and get out. Heath says the other walkers are blocking the way. Michonne says they have to lead the way. She says she won’t give up and Heath says not yet. Glenn proposes burning a building to distract the herd so they won’t go on to Alexandria. Michonne says she can do it and tells Glenn he has a wife to think of. He says that’s why he’s doing this and tells Michonne to lead them while he does the distraction. He says if he gets stuck he’ll hide and let them know he’s okay. Nicholas tells Glenn he knows of a feed store with lots of dry stuff. He says he’ll go but then Glenn gives him a look and Nicholas says he can just draw a map. Glenn says he can but there’s one thing to do first. He pulls out his pocket watch that Hershel gave him. We see Rick running top speed down the road. Some walkers are eating someone. Glenn radios him and he stops. He tells him what town they are in and that he’s setting a fire to distract them. He says if he doesn’t see smoke, they’re still coming their way. Glenn says good luck dumbass. Rick loots the body hastily then runs on. Michonne and Heath bandage Annie who tells them to leave her since she’s slowing them down. She says just leave me and the gun shot guy Scott says the same. Heath says no. He says they have to go together and have each other’s backs. He says we don’t leave people behind. He looks at Michonne then says – not us. Michonne says no one is leaving anyone behind. Heath says he’ll find something for Annie. Michonne speaks to Heath and asks what his problem is. He says he’s just looking out for his people and tells he heard what Rick said. She asks which part and he says about how they won’t all make it and she says Glenn is risking his life for them and she’s still there. Heath says they’ll see when things get worse. Michonne says Rick said what he said and says Heath has not really been through it like Rick. She says they were out there and they know. She says if he doesn’t learn he will die. She asks if he’s done things that made him feel afraid of himself. 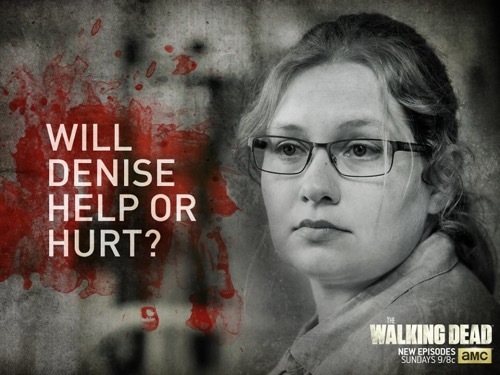 She asks if he’s ever been covered in so much blood you don’t know it it’s yours, walker’s or your friends’. She says until then you don’t know. Nicholas and Glen run down the street and spot a walker trapped under a car. Nicholas says to let him take care of it. He says the guy was on his crew and his name is Will. He says he was just 19 and they left him behind. Glenn tells Nicholas he’s not that guy anymore and says he’s here now. Nicholas nods and says okay then puts a knife in Will’s brain. They hear gunfire and they wonder if that’s home. Glenn says they need to go now. They take off at a run. Heath tells Annie and Scott they have to go now. Michonne looks out and sees walkers as they hear the gunshots. Michonne says the alley ones are being drawn by the gunfire. She says they sit tight until they clear then head for the feed store. Rick is still running all out as he makes it to the RV and the wall they built. He gets into the RV and cranks it. Blood runs from his cut hand. He drives away with the orange balloons fluttering atop it like a deranged clown car. Michonne and the others crouch out of sight while the walkers pass. The guy who was bitten scrawls a note for Michonne to take to his wife then she writes on her arm – you’re getting home. They are being silent because of passing walkers. Then they hear a banging on the back door. There are two walkers behind a door and they kill them but then heath says some of them heard it. Heath says they know we’re in there and says the herd will be here any minute. Michonne looks out in horror. The herd is there. She says – they’re coming. The group comes out of the pet shop shooting and hacking. They try to move ahead of the herd. Annie trips and falls and tells them to run. She takes out as many zombies as she can before they start eating her. Glenn and Nicholas run but then they see it already burned down. They also see the horde coming plus another group is coming from the other way. Glenn asks Nicholas where to go and he snaps out of it and says this way. Michonne leads them to a gate and tells Heath to go first. He goes. Then Michonne starts to climb but they’ve got hands on her legs. The bitten guy is also trying to climb. Glenn and Nicholas hit a locked door then there’s a chain link fence with walkers on the other side and more coming towards them. They shoot as fast as they can then run out of bullets. They both pull knives. They are overrun. The bitten guy falls back and is eaten. Michonne kicks loose and climbs over. It’s just her and Heath now. His letter is crushed underfoot by the horde. Heath and Michonne are trapped with the guy who was shot. Glenn and Nicholas climb up onto a dumpster and start kicking them away. Nicholas is freaked out fully. He looks down at the grasping hands and horrifying mouths. He starts crying. Glenn yells his name to get him to snap out of it. He tells him to look at him. He tells Glenn – thank you – then shoots himself in the head. Glenn grabs him as he falls and it knocks Glenn down. He screams as they eat him. OMG – Glenn is dead! Michonne, Heath and Scott limp for home. They come to a creek. Michonne sees there is no smoke which means the herd is still coming. Heath looks into the water and has so much blood he can’t tell if it’s him, the walkers or his friends’ – it’s just like Michonne said. Rick tries to radio Glenn to tell him he’s in place. No answer – just static. Glenn then tries Tobin. Nothing. He tries Darryl. He gets him and he says they’re almost here. He says he’ll get them going his way. Sasha radios Darryl to reiterate that he screwed up. Rick says he hears gunfire from home and says he has to hope they can handle it. He says they can’t turn back because they’re afraid. Abraham says they’re not. Rick says we can’t go back before it’s done because that would be selfish and for them, not their people. He says the herd must be close now. He uses some napkins to wipe away blood from his hand. The gunfire continues. Then a wolf comes into the RV – the one that Morgan let take a gun. Rick was about to radio again so the others hear the shots. Darryl stops and radios Rick who is busy wrestling with the Wolf. Rick beats the guy back then shoots him down. He searches the guy and sees a jar of baby food in the guy’s pocket. He sees someone else creeping up outside the RV – more humans. He grabs his gun and moves silently then fires the automatic weapon through the sides of the RV. Darryl speeds on the bike as fast as he can. Heath, Michonne and Scott make it back to Alexandria. They see the decimated guard tower and the crashed semi. Darryl meets back up with Abraham and Sasha – he changed his mind and turned back. The herd is still behind them – looks like thousands. Rick tries to crank the RV and is sputters. He can hear walkers snarling and close. He panics and says no, no, no. He tries again and again to crank it. The hard starts coming out of the woods. The RV still won’t crank and he’s got a dead body in with him that can still come back.